A major advantage of going electric for mobility is the flexibility it offers. Rather than using a complex and heavy powertrain, a KURT vehicle has up to 4 wheels with their motor with vehicle controllers controlling and steering the motors. While a single vehicle controller can control the whole vehicle, controllers can be added for redundancy when safety requires it. The vehicle controller steers but also monitors. Sensors tell it about the status of the battery and warn when the temperature becomes too high. Sensors measure the wheel speed and yaw rate, allowing to keep the vehicle in a safe operating zone. All this information can be communicated to a smartphone or tablet that communicates with a central server, for example for fleet management and scheduling purposes. 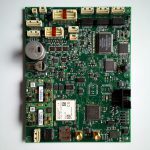 The brain of the controller runs Altreonic’s fault-tolerant VirtuosoNext RTOS. The high performance vehicle controller itself is an in-house design giving us complete control and flexibility. Multiple redundant controllers can be used to increase safety and performance if the application requires it. In the diagram below this is illustrated. In the simplest case, no redundancy is used and one controller is used powering just two front wheel motors, although it could also power all four wheels. In the next case dual redundancy is used so that when for example the front section has an issue, the vehicle can without interruption continue just by using the rear wheel motors. In the last case quadruple redundancy is used. 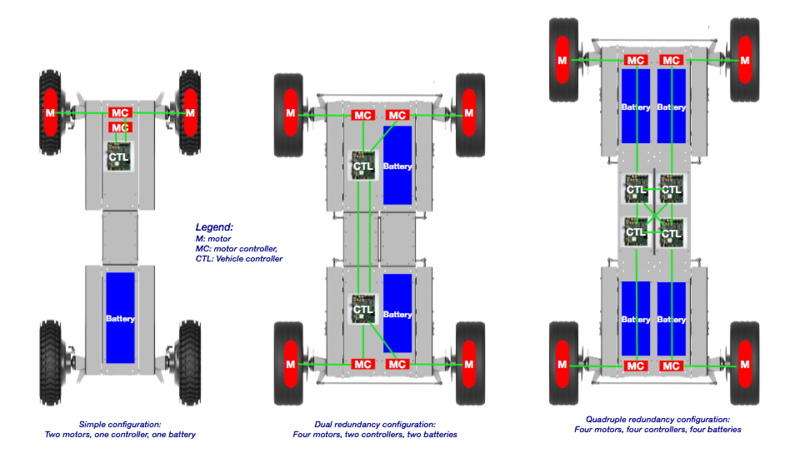 If one unit has an issues, then the software wil immediately adapt the control strategy so that the remaining motor wheels continue to steer the vehicle correctly.